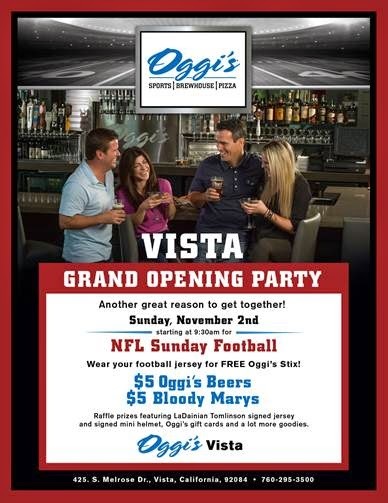 Oggi’s will celebrate its newly opened Vista location with a grand opening football party on November 2. Festivities at the newly opened 18th Oggi's location will kick off at 9:30am with raffle prizes including a LaDainian Tomlinson signed jersey, LaDainian Tomlinson signed mini helmet, t-shirts, pint glasses and Oggi’s gift cards. Each guest wearing a football jersey will receive a free order of Oggi’s Stix-pizza dough topped with parsley, mozzarella and parmesan cheese as well as enjoy $5 Oggi’s beers and Bloody Marys throughout the day. The Mighty 1090 street team will also be on hand to give away even more items. Oggi’s in Vista officially opened for business on October 21 and is open from 11am til 9pm Sunday through Thursday and 11am until 11pm Friday and Saturday. Oggi’s will open at 9:30 a.m. for Saturday and Sunday College and NFL Football games. The restaurant is located at 425 S. Melrose Drive in Vista and the telephone phone number is 760-295-3500. Visit Oggi’s online Oggis.com for more information.